Dead Good Disco is super proud to announce that the headlining DJ for the August ‘1991 Rave at The Trades’ is none other than DJ / Producer and old school hero, Slipmatt. An absolute master in his craft DJ Slipmatt achieved global status as an in-demand DJ during the glory days of the 90’s rave scene. Playing at old school events such as Perception, Fantasia, Dreamscape and Helter Skelter, not to mention the old UK clubs to which many ravers still hold dear to their heart. He is without doubt a true pioneer of the 90’s rave scene and is also one half of the legendary duo SL2. SL2, also known as Slipmatt & Lime, hit the scene in 1991 with their first 12” release on XL Recordings ‘DJs Take Control / Way In My Brain’ with both tracks causing absolute mayhem on the underground dance floors with ‘DJs Take Control’ gaining further success by reaching number 11 in the UK charts. Riding high on their success, their second release ‘On A Ragga Tip’ tore up the dance floors with a unique mixture of reggae and breakbeat and was so successful it went on to hit the number 2 spot in the in 1992 UK charts. 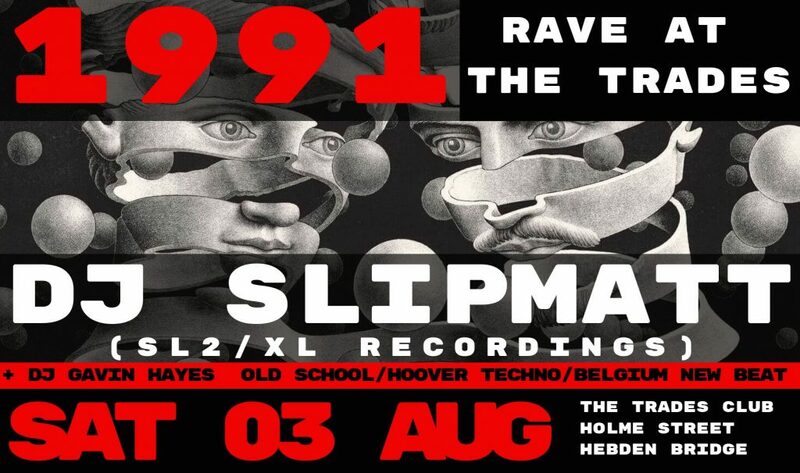 This is gonna be one hell of a trip down old school memory lane and we hope you can join us in welcoming DJ Slipmatt to Hebden Bridge Trades for this special event, and to make it even better we’ve extended the music licence until 2:30am!